The Hershey Bears have continued to narrow the gap in the Atlantic Division thanks to a point streak that has extended to nine games. The Chocolate and White won both games last weekend to move to 8-0-0-1 since Jan. 12, giving them the league’s third longest point streak. Nine of Hershey’s remaining 10 games in February are versus Atlantic Division foes, including a mid-week match-up at Springfield this Wednesday, and two home games versus Charlotte this weekend. The Bears are six points out of a playoff spot with one less game played than fourth place Lehigh Valley. Last week, the Bears returned from the All-Star break and picked up right where they left off. The Chocolate and White started the weekend with a 2-1 victory over Lehigh Valley on Saturday night at the Giant Center. Nathan Walker opened the scoring at 8:21, and Ryan Sproul’s second period tally from behind the goal line proved to be the game-winning goal. Netminder Ilya Samsonov earned the win with 21 saves. Last Sunday, the Bears scored a 3-2 shootout win over the Belleville Senators. Shane Gersich opened the scoring on a breakaway at 7:11, and Mike Sgarbossa added a first period goal. Hershey killed a five-minute major penalty on Nathan Walker late in regulation and in overtime to force a shootout. Riley Barber had the lone goal of the skills competition to give Hershey the win. -Wednesday, Feb. 6 at Springfield, 7:05 p.m.
Saturday, Feb. 9 vs. Charlotte, 7 p.m.
-Sunday, Feb. 10 vs. Charlotte, 5 p.m. The Bears are committed to giving back to the local community. On Feb. 12, members of the Bears will visit Tri-Community Elementary, and other select players will assist in celebrity bingo at the Penn State Children’s Hospital that day. Later that night, select players will play games, sign autographs, and meet with fans at Dave & Busters in Camp Hill from 5-7 p.m. 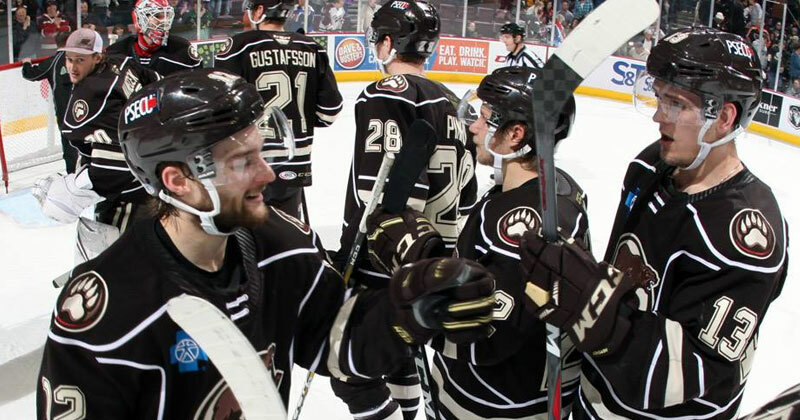 BREAKING DOWN THE STREAK: In Hershey’s nine-game point streak (8-0-0-1), the Bears have outscored opponents 29-14. Since the streak started Jan 12, the Bears have out shot the opponent in eight of the nine games, and 281-206 overall. In the run, the penalty kill is 33/39 (84.6%). Mike Sgarbossa leads all Bears with 11 points (five goals, six assists) during the streak. Defender Ryan Sproul has scored the game-winning goal on three different occasions. Netminder Ilya Samsonov is 5-0-1 with a 0.98 goals against average and a .953 save percentage, while fellow goalie Vitek Vanecek is 3-0-0. IF YOU’RE NOT FIRST, YOU’RE LAST: Entering this week, the Bears have scored the game’s first goal in 14 of the past 15 contests. The Bears are 17-7-0-2 when they notch the game’s opening tally. Hershey has scored first 26 times this season, the second highest total in the Atlantic Division, only trailing Bridgeport (27). Both Mike Sgarbossa and Nathan Walker have scored the first goal of the game six times, a mark that is tied for first in the AHL. SHOT DOWN: During the Bears nine-game point streak, the club has kept opponents under 30 shots in each game, under 25 shots on five occasions, and under 20 shots twice. Opponents are averaging just 22.88 shots per game during the point streak. The Bears allow the sixth least shots in the AHL per game (27.72), a ranking that has improved from 12th at the start of the streak. DJOOSY DJOOS: The Bears received a boost with defender Christian Djoos joining the club from the Washington Capitals on a long-term injury conditioning assignment. Djoos, who has four assists in 28 games with the Caps this season, was injured on Dec. 11. The 2018 Stanley Cup champion had 81 points (21 goals, 60 assists) in 129 games with Hershey from 2015-17. RILEY REWARDED: Last week, Hershey forward Riley Barber was named the CCM/AHL Player of the Month for January. Barber had 14 points (seven goals, seven assists) in 10 games during the month. He tallied five multi-point games in that span and added a pair of game-winning goals for Hershey. BEARS BITES: Forward Liam O’Brien played in his 300th professional game last Sunday vs. Belleville…Hampus Gustafsson’s next game will be the 100th in his professional career…Hershey’s nine-game point streak is the club’s longest since they posted points in 10 straight games from Nov. 16-Dec. 9, 2016. Hershey was 8-0-2-0 in that stretch…Forward Nathan Walker has been suspended one game for a kneeing incident in Sunday’s win over Belleville.